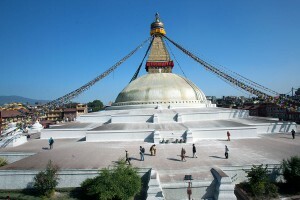 Kathmandu is Nepal’s capital city and your probable arrival and departure point. 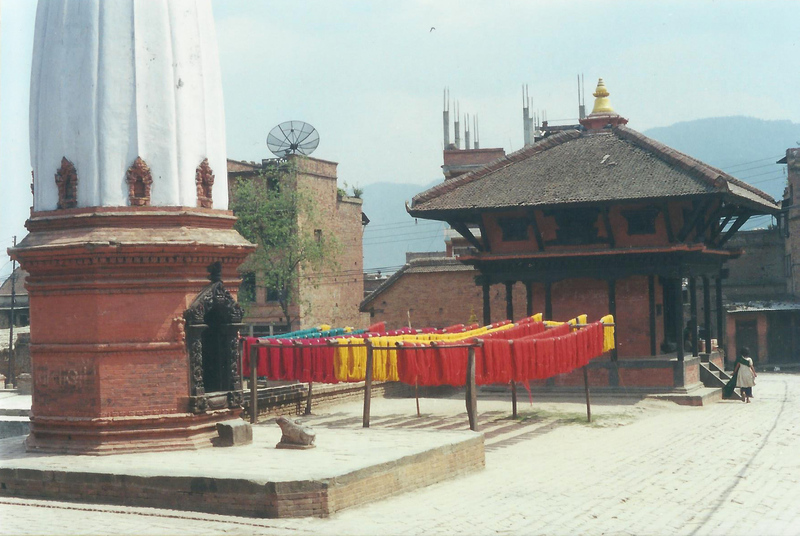 For tourists it fulfills three main functions: (1) as a kick-off point for a trip to Nepal, (2) as a base for exploring the Kathmandu Valley and (3) as a tourist destination in itself. 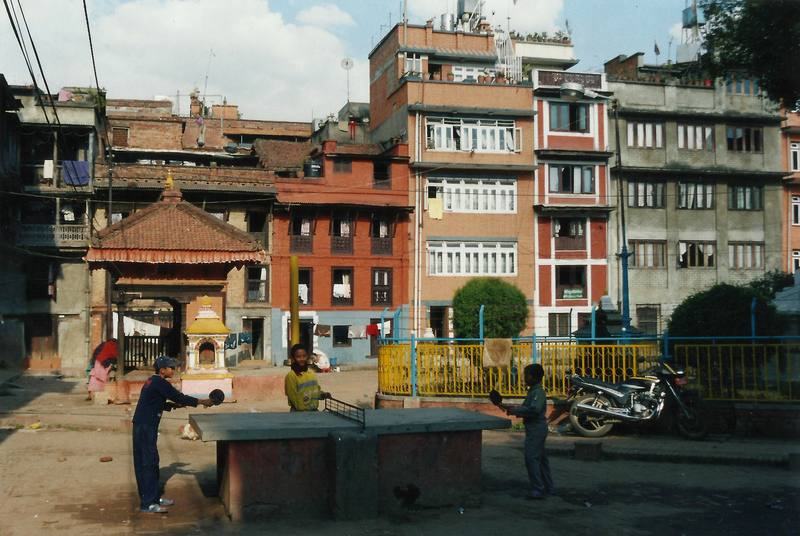 (1) Kathmandu Durbar (Square) – or link here – is a short walk or rickshaw ride from the main tourist drag of Thamel. 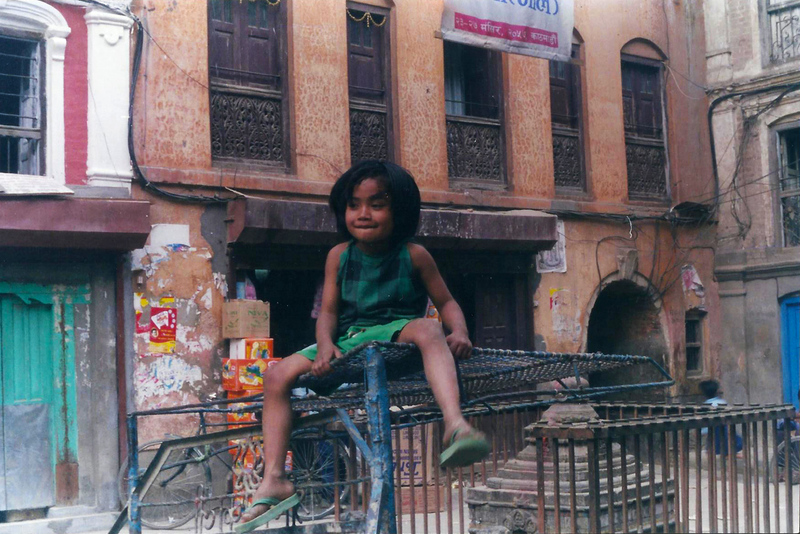 The Durbar is a busy traditional city centre best visited in the cool of the evening and there are many nooks and crannies to explore in this ancient narrow-laned area. 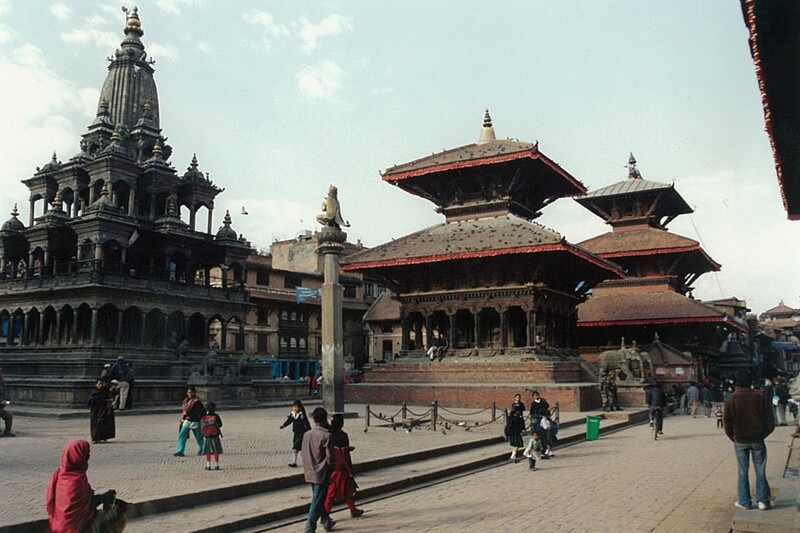 “Kathmandu Durbar Square still displays an ancient surrounding that occupies two hectares of land. It has palaces, temples, quadrangles, courtyards, ponds, and images that were brought together over three centuries of the Malla, the Shah, and the Rana dynasties”. We can supply you with a guide to show you around. 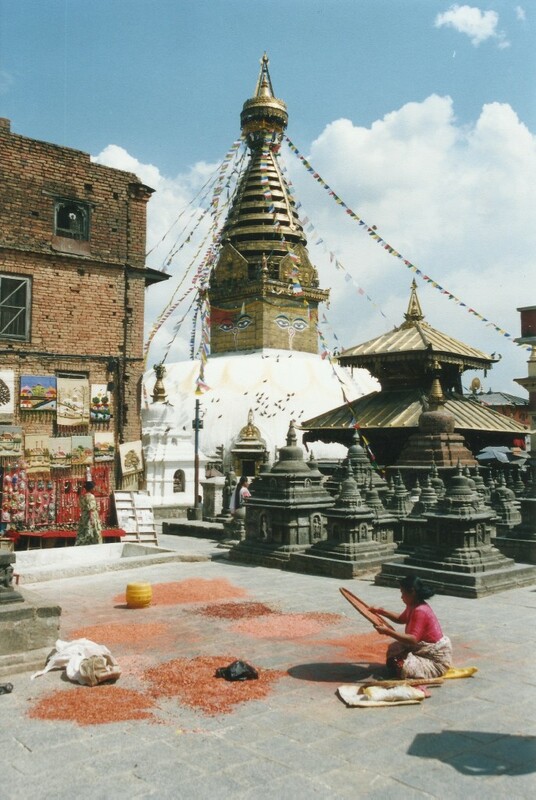 (2) Swayambhunath – The Monkey Temple (picture above lower left) is an eclectic paeon to both Buddhism and Hinduism. 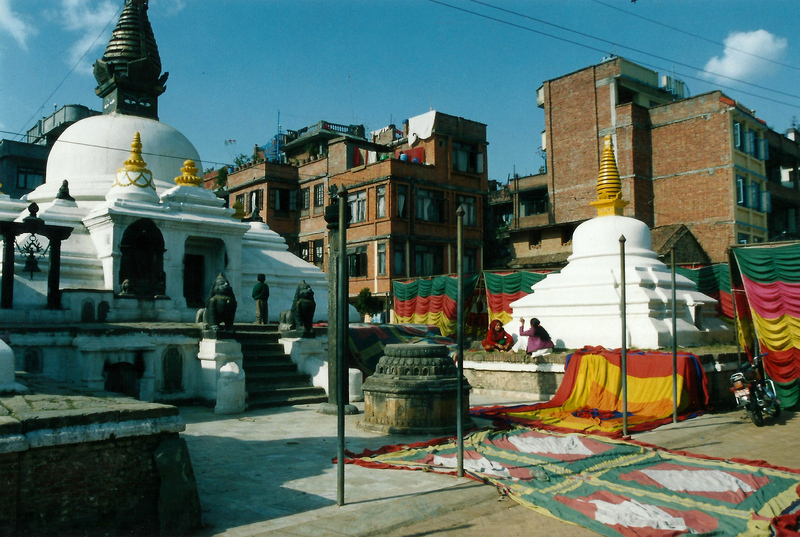 Both a stupa/temple set on a hill and a popular tourist spot this can be reached from Thamel by motor and can be included in a city tour along with (3) the massive Buddhist Stupa at Boudhanath (picture top middle), a must see huge gilded stupa in a beautiful circular setting, which is best visited late afternoon after the tourist buses have departed, and (4) the nearby Hindu Temples and Ghats at Pashupatinath (picture top right), again best visited late or very early away from the tourist hordes gathered like vultures to photo the cremation ceremonies. We can provide you with both transport and a guide. 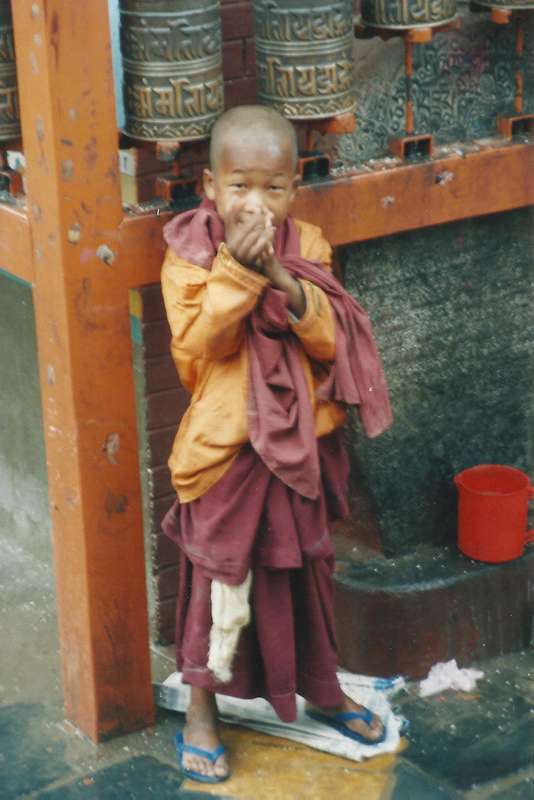 5) Kopan Monastery is a peaceful place, not far from Boudhanath, to get away from the clutter of the city streets. 6) Budhanilkantha is a magnificent Vishnu Temple near the entrance to Shivapuri National Park (see section (6) below). 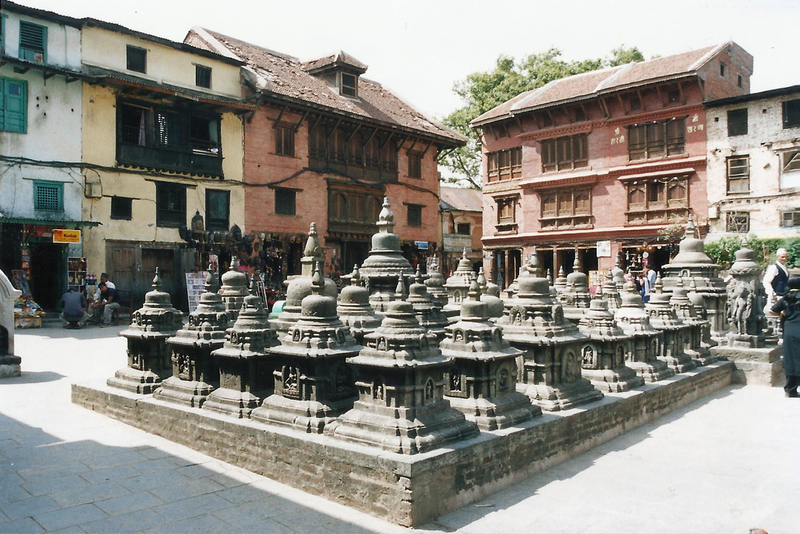 (1) Patan Durbar (picture top lower middle and below middle) or (other link); a short trip from Kathmandu takes you to the Royal City of Patan, which has a more relaxed medieval city centre than Kathmandu. You should check this out. 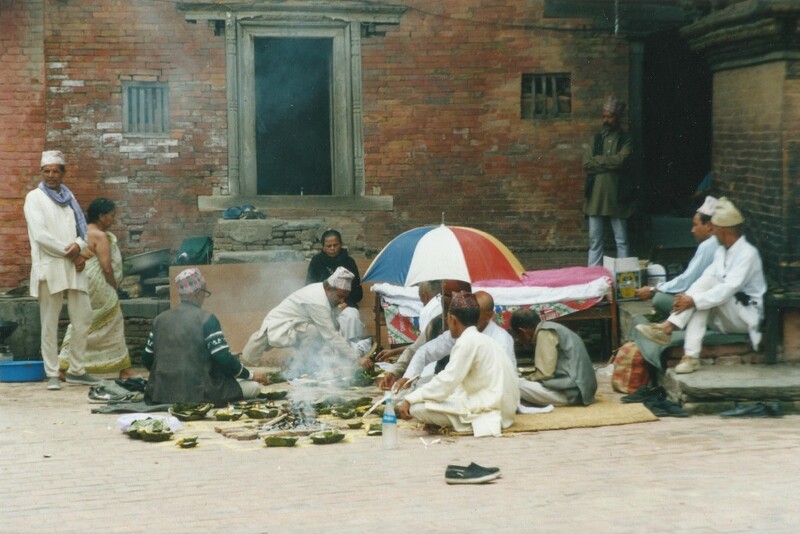 Nb the Patan Museum is a must-see for all with an interest in Nepali or religious art. 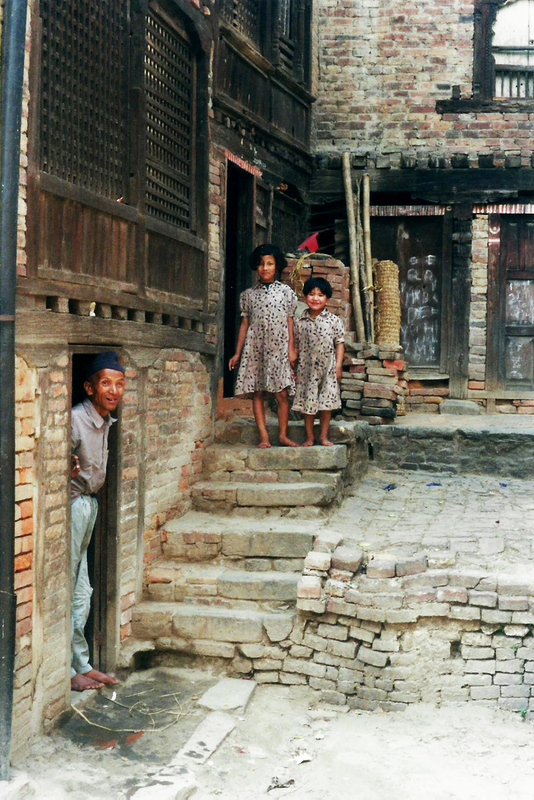 (2) Bhaktapur (picture below left); the third of the Valley’s Royal Cities is a real olde world town with an ancient town centre, narrow lanes, temples, ancient ponds, olde buildings, chickens in the street, rice drying, monuments, goats… it’s a surreal combination of both country and medieval town (with the saving addition of a sewage system donated through foreign aid). This is a great place to wander off its rather commercial tourist drag and a half day can easily be spent here exploring nooks, crannies, squares etc. Take a compass and a map and, of course, a guide as it’s easy to get lost in the labyrinth of streets. 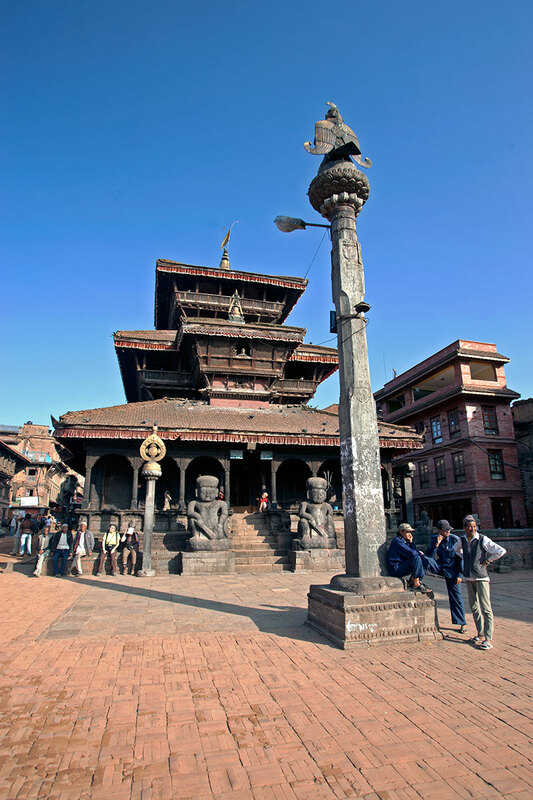 Just 5 km north of Bhaktapur is the UNESCO World Heritage site of Changu Narayan, an ornate temple filled with important 4th to 9th Century statues and carvings. This is well worth a visit. 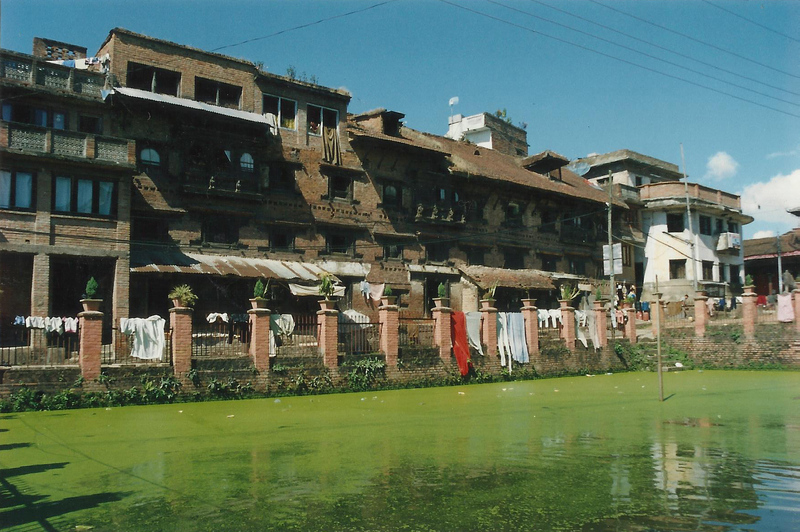 (3) Kirtipur is a beautiful non-touristy village built on a hill near Kathmandu. 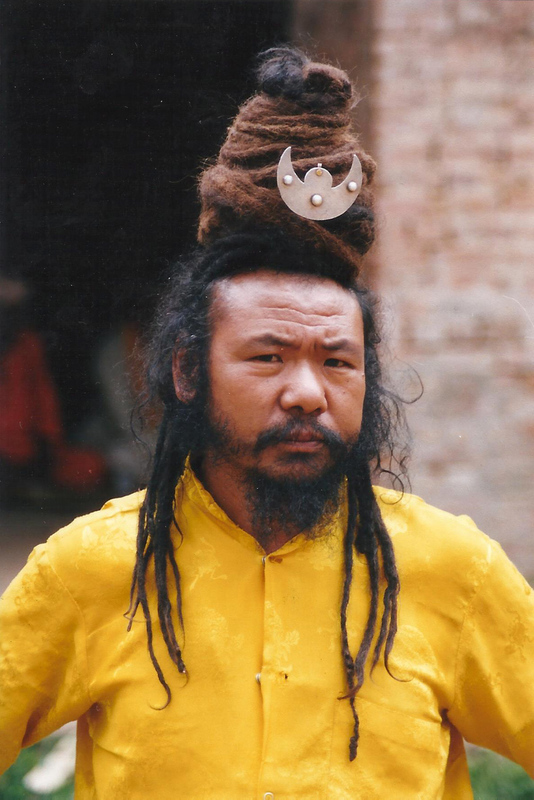 On the same trip visits can be made to the blood-soaked animal sacrifice temple of Kali at Dakshinkali and to the Buddhist “gompa” (monastery) centre of Pharping. 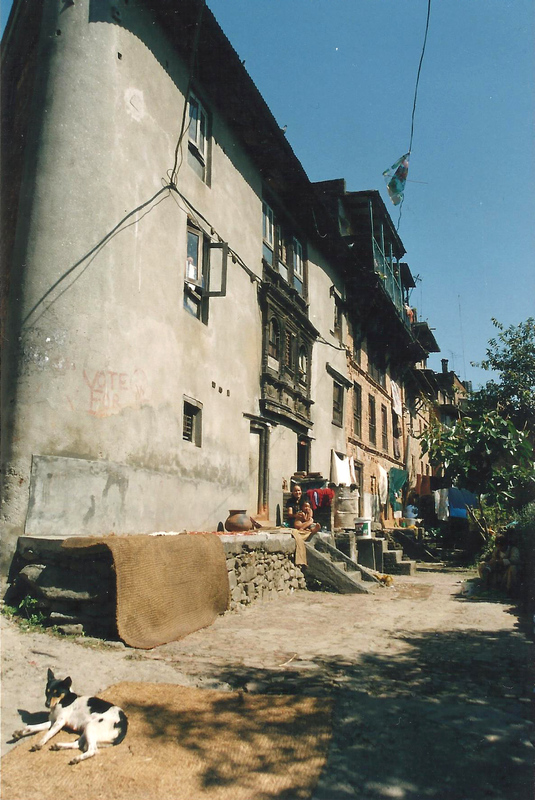 Both Dakshinkali and Pharping have tempting hills to climb and Pharping is a great little Newari village to wander around when you’ve seen the temples. 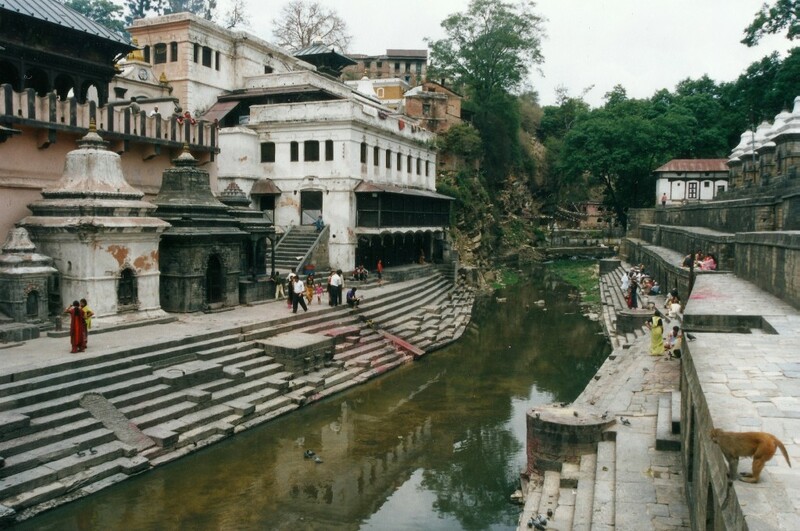 A brief stop can be made at Chobar for a view of the gorge, through which all the water leaving the Kathmandu Valley pours, and the adjacent Adinath Lokeshwar Hindu temple. For erstwhile potholers/spelunkers a visit can be made to the adjacent caves or (other link). 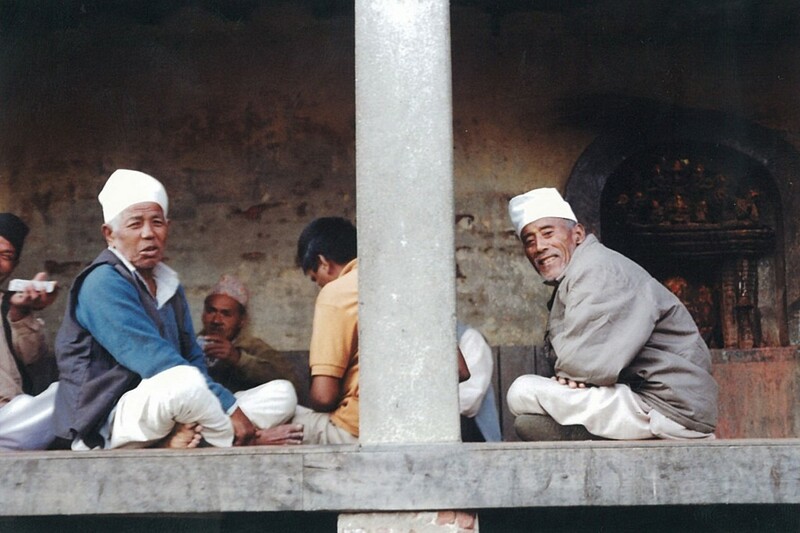 (4) Nearby Bungamati is a traditional village whose small traffic free streets are surrounded by artisans, mainly woodworkers and carvers, and it is the site of one of an important Rato Macchindranath Temple, an historic religious centre for Hindus. (5) Himalayan Views; the fashionable tourist resort of Nagarkot (2,175m) has perhaps the best views of the Himalaya from anywhere in the Kathmandu Valley. We can arrange transport for you and a night in a hotel there. 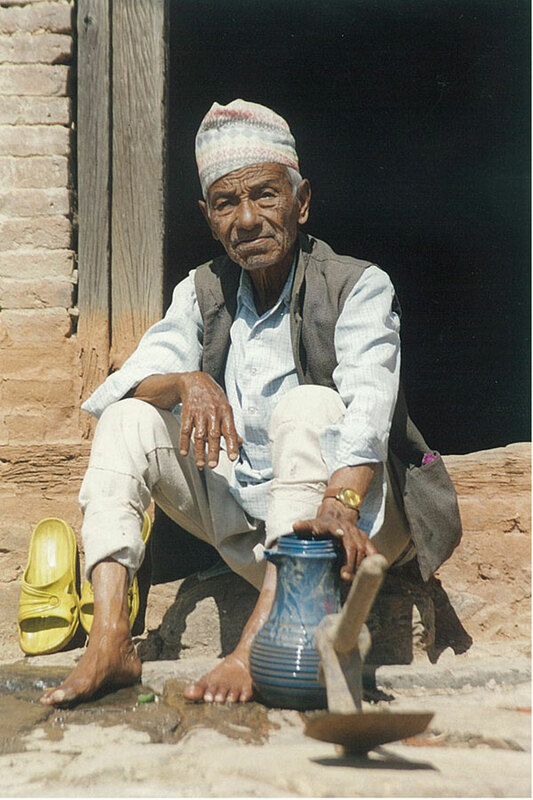 Nagarkot can get very cold in the winter so take jackets, hat etc. However we recommend the charming Balthali Village Resort, from where great all round views are had and both short and all day treks can be done, including a 2 hour walk to Namo Buddha, an authentic Buddhist shrine which the indigenous Newars call ‘Namra Bhagwan’. 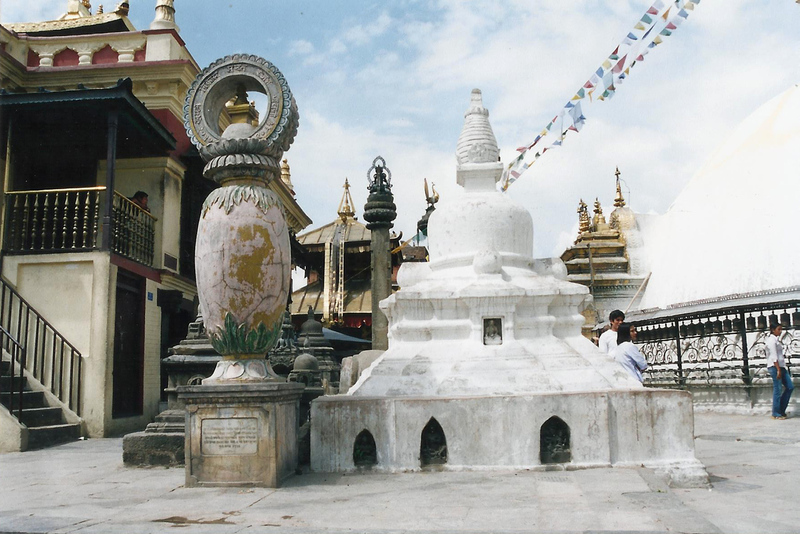 Buddha is commemorated here by a mysterious ancient stone slab and a stupa with the angular eyes of the Enlightened One. 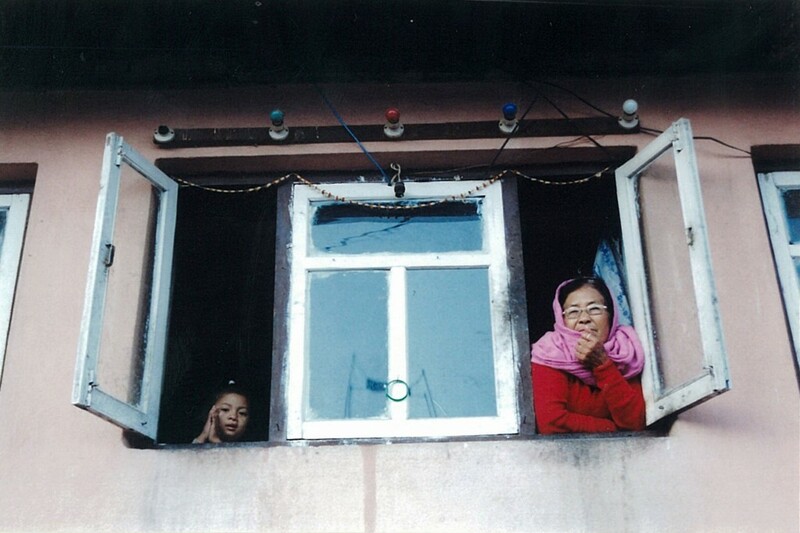 A sunrise view of the Himalayas is (almost) guaranteed from October to March, but will not be seen in the monsoon season from June to late September. Balthali Village Resort is set on a hill near the charming laid-back temple-filled ancient cultural town of Panauti, considered one of the region’s most important medieval sites. The river junction here is used for the Hindu practice of cremating the dead and a trip here takes us through picturesque surrounding villages. An alternative for great views is for us to take 27 km of winding road to Kakani and stay there, though bear in mind that this is not a tourist resort, the hotels are not good and, consequently, agents don’t like sending tourists there. Nearby is the Thai Memorial Park which provides a resting place for the 113 casualties of a Thai Airways plane that crashed near Gosaikunda in 1992. 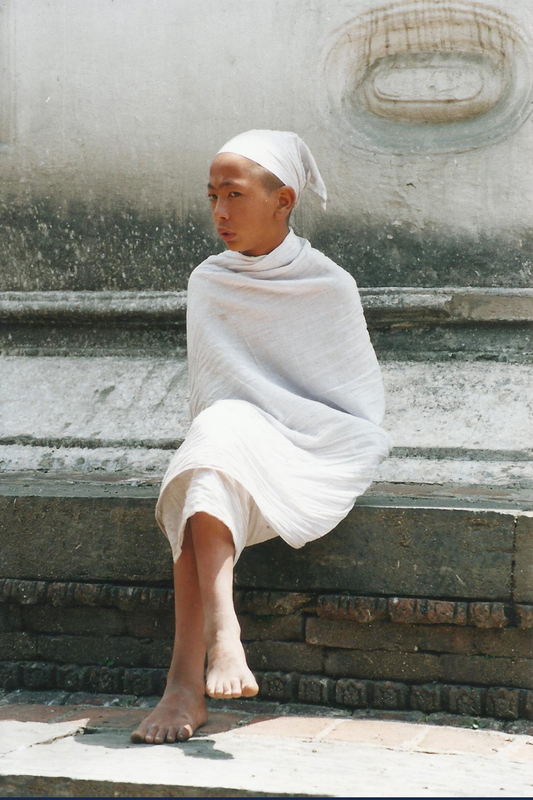 (6) A trip can be made to the Shivapuri National Park (20/30 minutes from central Kathmandu) with a short walk to the Tibetan nunnery of Nagi Gompa or a day long walk to Shivapuri peak and back. Take a day’s tour and walk, in March to late April, to see flowering rhododendron forests. Intermediate length walks can be arranged here. (7) Try a 160m bungee jump or a swing in a canyon over the wild Bhote Kosi river (3 hours from Kathmandu) courtesy of The Last Resort. We can take you on a day trip or book you in here for a night and for other activities. A day trip including the swing or bungee will cost in the order of US$80. (8) Try a day’s rafting or kayaking on the Trisuli river. 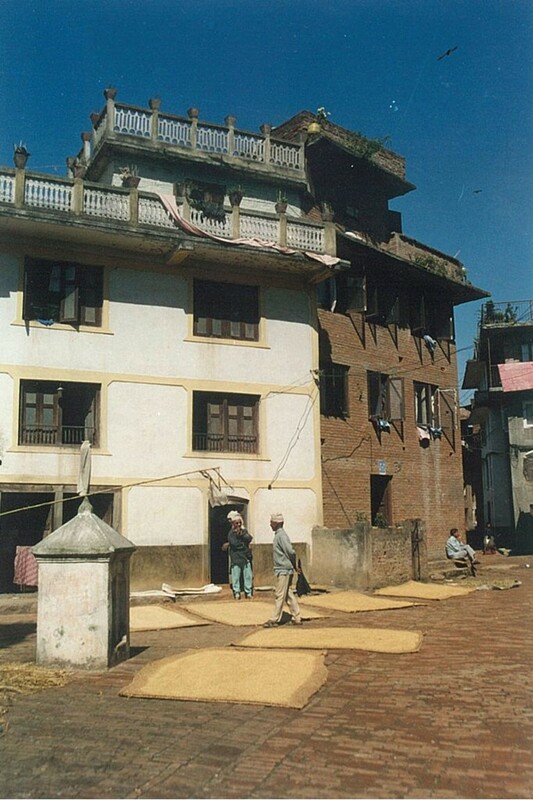 (9) Hopefully our trips will take us through other picturesque Newari towns and villages, like the villages around the town of Banepa, but let’s see how much time we have. Up to 3 people, US$ 20. Up to 7 people, US$ 24. 8 or more people, US$ 30. An English speaking guide and driver with car taking 3 of you, 4 at a pinch, for the day will cost US$ 65. Ditto a small van taking 4 to 7 of you will cost US$ 110. Ditto a minibus taking up to 16 people will cost US$ 155. Ditto a full size bus will cost US$ 160. Prices are exactly halved for a ½ day’s tour. Entrance fees to temples, parks etc are not included. 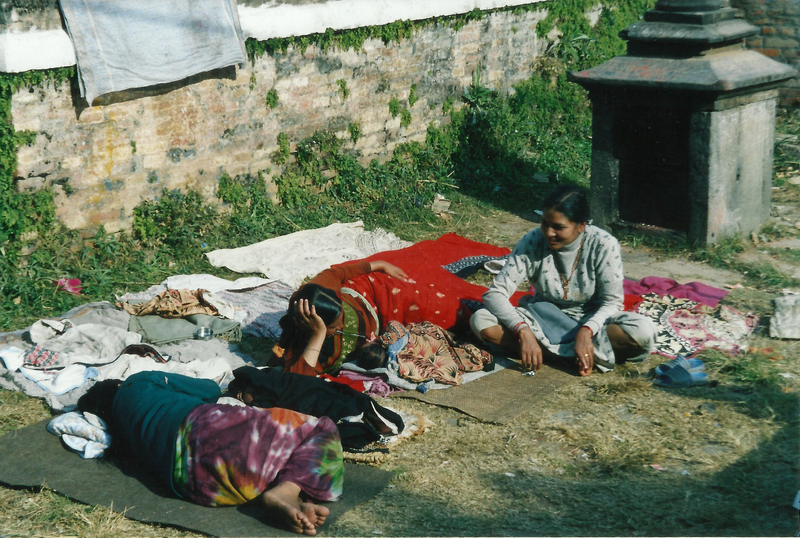 NB There is a fee of 1,500 rupees, approx US$ 15, though only 100 rupees for SAARC passport holders, to enter Bhaktapur. 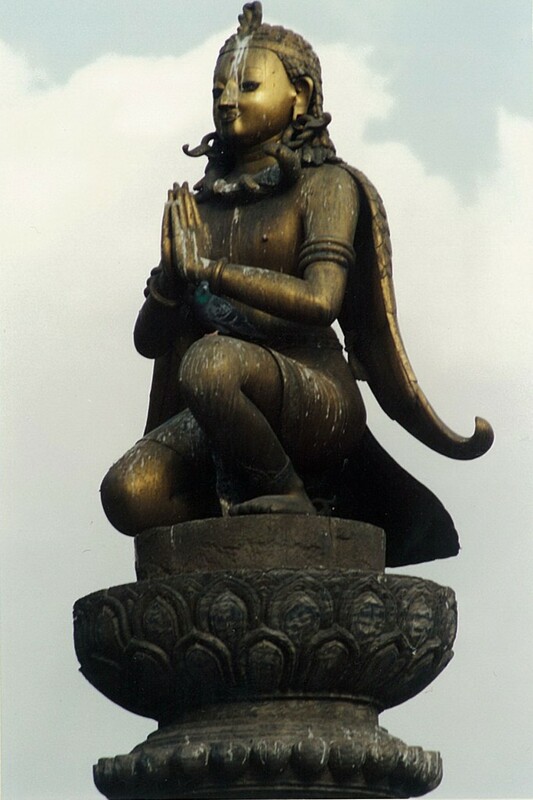 There is an entrance fee of 1,000 rupees, to enter Pashupatinath (Hindus for free and other SAARC passport holders 100 rupees) and 750 rupees to enter Kathmandu Durbar museum. 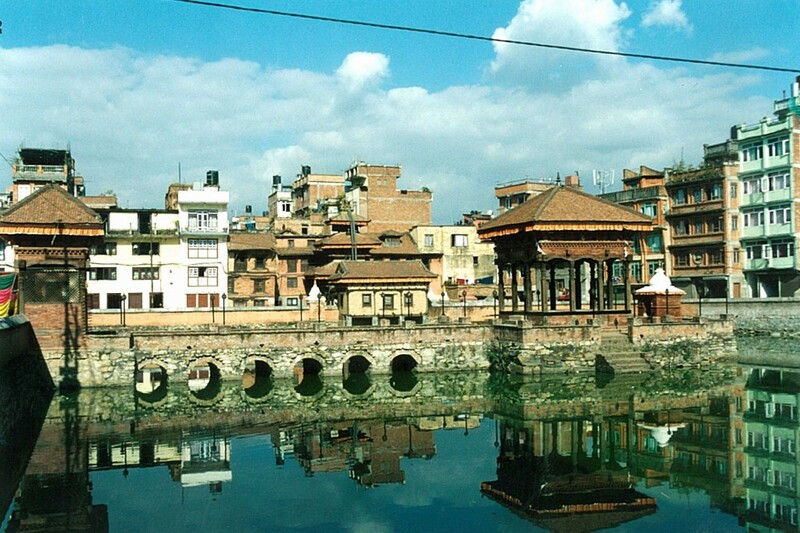 A list of entrance charges for places in the Kathmandu Valley can be found here.